The airplanes were given the names of Sts. Alexander Nevsky Dmitry Donskoy, and Mercury of Smolensk. March 18, 2014. PRAVMIR. For the first time, three MiG-29 aircraft were blessed at the “Erebuni” airport in Yerevan, Armenia. This took place on March 14, following the return of the aircraft from repair work. The maintenance personnel were also given Gospels and Psalters, sent as a gift from Moscow, from Patriarch Kirill of Moscow and All Russia. The books of Holy Scripture were given to the aviators by Archimandrite Andrew (Vatz), assistant commander of the Russian 102nd military base, who works with soldiers. According to him, 75% of the soldiers of the Russian 102nd military base profess Christianity or Islam, notes the website NovostiNK.ru. The priest blessed three combat MiG-29 aircrafts with hull numbers 21, 23, and 24 in honor of Sts. Alexander Nevsky, Dmitry Donskoy, and Mercury of Smolensk. Fr. Andrew noted that these are especially revered saints who, being warriors, marked their earthly journey with military glory and became saints in the understanding of the Christian tradition. The Church honors them as saints, and soldiers honor them as their patron saints. 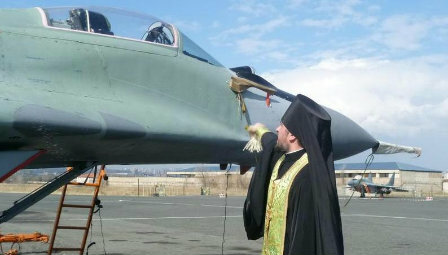 The blessing of the airplanes was part of a series of events dedicated to Great Lent. It is planned that, during Lent, more than 500 military objects at the Russian military base in Gyumri will be blessed, as well as about 15,000 pieces of weaponry and military equipment.